I am enjoying my new found ability to actually make sushi. Shaun, he of the sushi craving, is a more than willing participant in these sushi experiments. We made two kinds the other night--a semi California roll with avocado, crab and spicy mayo, and a sort of combo roll with crab, shrimp, avocado, cucumber, and daigo (a spicy yellow radish thing he makes). I overestimated the amount of rice, so we wound up with 27 large pieces of sushi, somewhere between 2 and 2.5 inches in diameter. We also learned that you can refrigerate leftover sushi if necessary. For lunch, the other day, we utilized some of the leftover sushi. Shaun took 6 of the big California rolls (these are the 2 inch diameter ones). The sixth piece got tucked into the box, but I had to pull it up for the picture since I'm really proud of my sushi. He had a chef salad (dressing at the office), a boiled egg, and one of Faith's cranberry-pear gingerbread muffins. The little blue container holds soy sauce for his sushi. 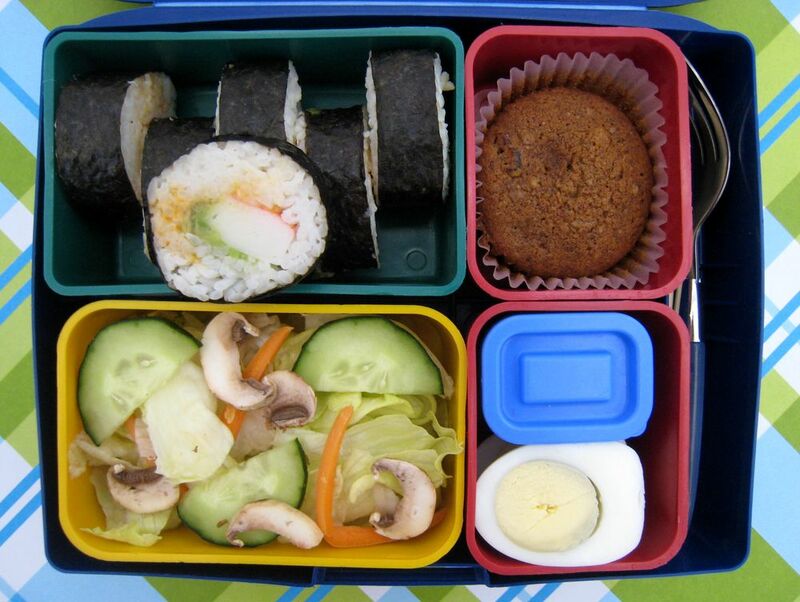 It's packed in our Laptop Lunch box, due to the sushi needing to be separate from everything else. very professional looking sushi! You just have a way with food! How does your husband eat sushi? Hot or cold? I don't know how its meant to be eaten and just wondered if he heated it up. Hi!! Just stopping by to say "hi" and thank you for the introducing me to Bento, as I recently prepared my first Bento lunches for my little ones...they loved it, just posted on my blog about it. Thanks so much for the inspiration!!! Your sushi looks great! I used to make this a lot for my kids to take to school in their lunch too but then they got pickier and said I don't make it "right". :-) I have a real problem overfilling too and they end up huge. I was just thinking today I needed to add a sushi roll kit or even just the bamboo mat to my holiday wish list!